if you follow me on facebook, you saw that i asked for your advice on sunday. i made cupcakes on a whim on sunday afternoon + they turned out way more fantastic than i expected. but, we were scheduled to go to dinner at my in-laws’ house, which didn’t leave enough time to make buttercream, frost ’em + still make it to dinner in time. so i asked, what should i do? show up 30 minutes late to dinner, bearing delicious sweets? or show up on time, bringing nothing? the vast majority of you said to show up late with the sweets, which is what i did (after calling, of course) + i’m so glad i did. what inspired these cupcakes? looking in the pantry on sunday, i realized that i had all the ingredients to make these delicious dark chocolate cupcakes with peanut butter frosting. i wanted to try something different, though, + pulled out coconut + coconut extract to see if i could tweak the recipe to make a chocolate-coconut cupcake. i played around with the cupcake recipe + came up with a coconut buttercream recipe + the results were simply amazing. the cupcakes are moist, rich + delicious, while the coconut buttercream provides a luscious, creamy counterpoint to the decadent dark chocolate. add a little toasted coconut garnish + voila! the perfect sunday afternoon dessert! sift about 1/3 of flour mixture over chocolate mixture + whisk until combined, then whisk in sour cream. sift in remaining flour mixture + whisk until batter is homogeneous + thick. add in the flaked coconut + stir until well-combined. reduce speed to medium. add sugar, 1/2 cup at a time, beating after each addition, about 5 minutes. (after every 2 additions, increase speed to high, and beat for 10 seconds, then reduce speed to medium-high). me, too – chocolate + coconut is just pure awesomeness. These look heavenly–I love chocolate and coconut together. And I’ll bet your mother-in-law didn’t mind one bit having you show up late with *these* in hand! isn’t it a great flavor combination? my mother-in-law definitely didn’t mind one bit that we were a few minutes late + she loved the cupcakes, especially the buttercream. father-in-law was awfully happy with ’em, too! Yay…that’s what I would have done too. Nothing’s complete without dessert! 😉 These look delicious…a great combination! It’s like almond joys in a cupcake form. Mmm! glad you would’ve done the same thing! that makes me feel better. =) i love almond joys, so it’s no surprise that i loved these so much! Dark chocolate + coconut + butter-cream = yummy in my tummy! Yum. Love the toasted coconut on top. the real miracle was that i managed to toast the coconut without burning it. more than once i’ve turned my back for a minute too long + boom! burned coconut, smoke-filled kitchen. this time i got it right! These are just in time for a cupcake war we are having at work next week. I think I may have found my entry! first of all, i want to work where you work! cupcake war? that sounds amazingly fun. i can’t wait to hear what you make, whether it’s these or another one of your wonderful creations! i love ’em, too + if you like mounds, you’ll looove these. swoon indeed! 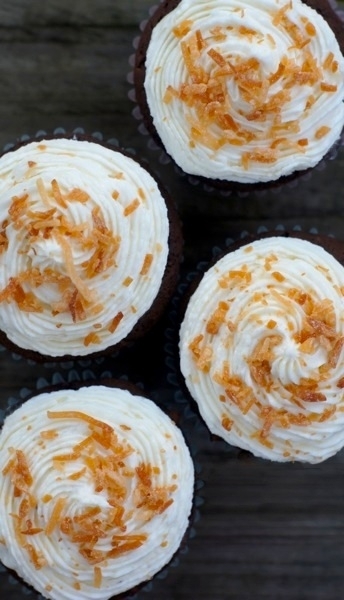 I can’t wait to try your coconut buttercream recipe! I usually find buttercream too sweet, but I think the coconut flavor would add some interest for me. the coconut definitely cuts the sweetness but it still might be too sweet for you – you could add in some fresh lime juice or even some rum to reduce the sweetness even more. It’s odd, but since the cupcake craze hit, I rarely ever see a good dark chocolate cupcake. Lots of milk chocolate, but rarely ever my favorite dark chocolate. Except here And I really like the pairing of coconut. The roasted coconut on top is especially pretty! Did your in-laws love them? agree – i’m much more a dark chocolate person than a milk chocolate, so i use it in lots of baking. the in-laws loved ’em! in fact, my father-in-law said, ‘this might be the best dessert you’ve ever made.’ but i swear he says that after every new dessert i make. ha! yes! i’m so glad you voted to be late with sweets – it was definitely the correct choice in the end! These sound great. I love this combo, and have been meaning to make something like these for a while. I like that you use sour cream in the batter, there are too many dry chocolate cakes in the world! i agree, there’s nothing worse than a dry cake! moist + rich is where it’s at. =) hope they turn out wonderful for you! Amy, you have a lovely space! I loved the idea of coconut buttercream! The recipe and the pictures look great!! thank you so much, Purabi! i’m off to check out your site – i’m excited because i see on your about page that you grew up in India, which is where my brother lives now. i love making any sort of India-related connections these days! These are simply beautiful! I never thought to make dark chocolate cupcakes. I love when my pantry inspires me to create something new Love the gorgeous toasted coconut on top. wow, I have no idea how you do it but these need to be in a bakery window. pronto. aww, that is so sweet. i’m working on my frosting/piping skills — they still have a long way to go, but they are getting better! Girl, this looks amazing! Wow, I love it! Gorgeous cupcakes! I want to be able to pipe frosting so pretty! Love the idea of coconut with these. And I agree with you, show up late with treats!!! I am so excited to make these! When do you add in the flaked coconut to the cake part? I am assuming that you added it to the dry ingredients? I swear I read this 15 times and never saw when you added it in. Maybe I am crazy? hey Jen! you are definitely not crazy. =) that’s the problem with adapting recipes + adding my own changes – i forgot to write them in! you add the coconut as the last step in making the batter. i just added it into the recipe. thanks for pointing it out + i can’t wait to hear how they turn out for you!